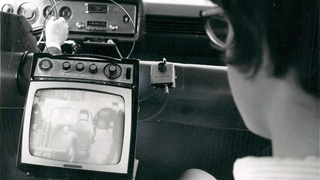 Called Autovision, Ford's portable tv set was offered by Lincoln-Mercury and Ford dealers (with initial sales in the Great Lakes area) for a suggested retail price of $169.95. What a bargain! Ford acquired battery, radio and television pioneer Philco in 1961 in order to have an in-house supplier of car radios and other electronic devices. Philco already had pretty advanced portable TV sets available at the time, so it was no surprise that four years later, Ford introduced a new one that was so small they could hang it by a bracket behind the front seats. This all-transistor nine-inch television had a 12 volt DC cord that could be plugged into the cigarette lighter or a portable battery pack, but also came with a 110 volt AC cord for home use. Philco became Ford-Philco in 1966 only to get sold to GTE in 1974 while Ford kept the aerospace portion of the company. Today, the brand is owned by Philips.